Griffin Brewster had big expectations just 8 months ago. 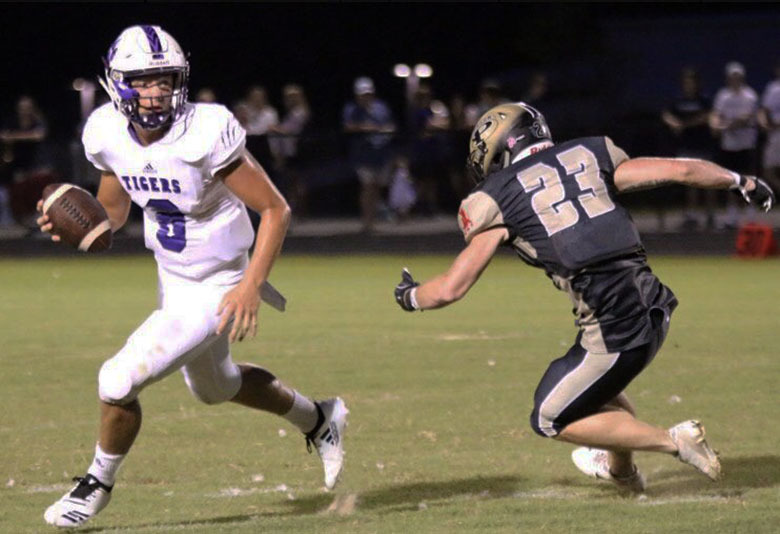 After starting his freshman and sophomore year at Darlington, the 2020 signal-caller was poised for a big junior year where he would lead the Tigers deep into the playoffs. The hype was high, the preseason rankings on our site had Darlington at #7, and with Brewster bring double digit games of experience under his belt, you could see the team trending up. It was all for not, at least for Brewster, and after just a few games into the season, the quarterback had torn both his ACL and meniscus. A major set back for the young athlete, but of course, that builds toward the epic comeback. For any young athlete, their first major injury can bring disappointment. They are used to going 100 mph, and now their is a 10 mph speed limit with safety bumpers. Brewster was not impervious, but learned an important lesson in the process. Darlington rebounded well from Brewster’s injury and made it all the way into the state quarterfinals before losing to eventual state champions ELCA. With the season well over, Brewster could focus on his development, and get his knee back to full health. Heading into his junior year, Brewster had several high caliber colleges interested, but with his injury, this offseason has been relatively quiet until Oklahoma state jumped in with an offer on March 29th. A lot is stirring in the pot right now for Brewster. He has been a 2020 quarterback that we have long considered to be one of the best in his class. His snappy release and football IQ to dissect a defense at a high efficiency keep defenses honest. Spring practice is right around the corner, and this upcoming May will be huge with how the the 2020 quarterback moves around in the pocket. Colleges will be looking into his live scrimmage, which could pay recruiting dividends. Brewster is already sharpening his sword, and got some live action earlier this month at The Opening. “It went very well. I threw with some of the top guys in the state and threw is will in front of a lot of people.” The comeback wheels started turning back last fall, at this point they are spinning at full force. The class of 2020 quarterback is getting more confident each week, and should see heavy college interest going into spring practice 2019.